When its first season aired this past fall I didn't write anything about AMC's mega-hit series The Walking Dead. Heck, I wasn't writing about much of anything at the time. But I had heard only good things about the show (adapted from the Dark Horse Comics graphic novel series of the same name) and tuned in to watch the premiere episode. And like so many others, I got hooked on The Walking Dead. This is not a story about a zombie apocalypse. Personally, I'm sick and TIRED of the whole "zombie genre". It's been done too much in recent years. Now I loved the movie Zombieland, because in my mind that was more of a comedy with some legitimate undertones of human drama. I can watch that movie a dozen times and not get bored with it. And that's how I am with The Walking Dead. This is a series about real people and the depths and contradictions of human nature. It also happens to boast what might be the best use of the undead in pop culture history: the zombies in The Walking Dead are arguably the most gruesome creatures to ever hit television. But the zombies are merely the catalyst accelerating the foibles and weaknesses of its very personable cast of characters. Watching this show, it's very easy to empathize with these people (I myself am a huge fan of Jeffrey DeMunn's character Dale, the older dude who drives the RV). Heck, I was even on the verge of tears at the beginning of the third episode, "Tell It To The Frogs", gazing at Merle and how pitiful he had become. The second season won't begin until this coming October but in the meantime, The Walking Dead: The Complete First Season just hit the streets on Blu-ray and DVD this past week... and it is chock full of rotting goodness! That is on top of the gloriously gruesomely amazing picture quality. I don't get AMC in high-definition, so I had to watch the first run of The Walking Dead in standard definition. Getting to see it in 1080P on Blu-ray was like an entirely new experience, and I picked out details that I hadn't noticed before (why does it disturb me so much that the little zombie girl in the very first minutes of the show is wearing braces?). The sound quality is also exceptional: the destruction of the Center for Disease Control at the end of the season finale literally shook a Darth Sidious action figure from his standing pose on my desk. 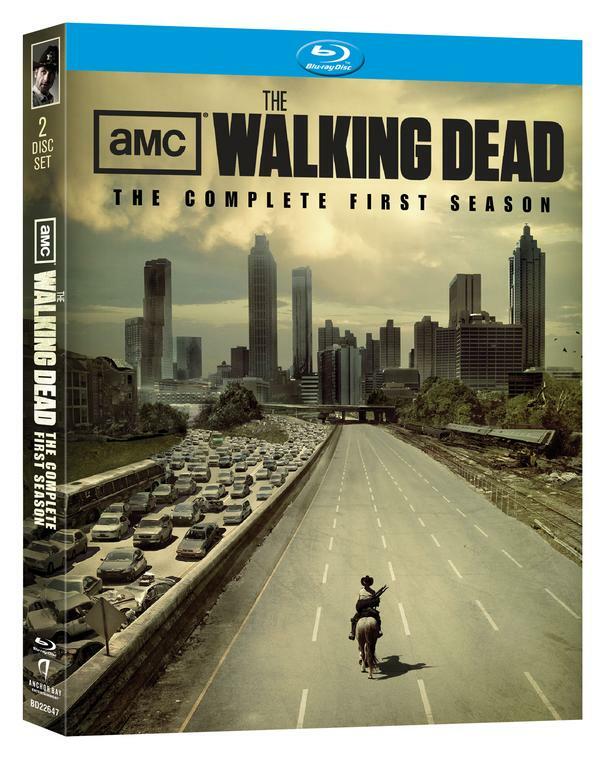 The Blu-ray of The Walking Dead Season 1 comes on two discs. Those include all six episodes of the first season, along with a considerable amount of special features. A half-hour long documentary gives a behind-the-scenes look at production of The Walking Dead. Each episode is also given a five-minute long mini-feature about that chapter's characters, themes, and place in the story. "On Set with Robert Kirkman" follows the creator of The Walking Dead comic series as he strolls around where the first scene of "Days Gone By" is being filmed. "Bicycle Girl" reveals what it took to bring the legless, hideous zombie woman in the series premiere to "life". For those who want to go against the living two special features stand out: "Zombie School" (chronicling how extras were taught how to walk and talk zombie-ish) and a fairly extended piece demonstrating how anyone can look like a zombie with common household items like gelatin and oatmeal. Jeffrey DeMunn takes us "Inside Dale's RV": the set piece that fast became synonymous with The Walking Dead's sense of human community. "Hanging With Steven Yuen" is the actor who plays Glenn giving a tour of the first campsite. But the most startling extra feature by far might be "On Set with Andrew Lincoln", focusing on the actor who plays main character Rick Grimes. I didn't know until watching this that Lincoln is British who normally speaks with a remarkable English accent. That he is able to turn on that Southern accent for his characer in The Walking Dead... it's just totally wild! Lennie James, the actor who plays Morgan (who found Rick after his escape from the hospital) is also British, and if you only watched the show you might have been none the wiser. The Walking Dead is the one show on right now that I'm investing my time to watch and enjoy. And though Season 1 was all too short (but happily Season 2 is already slated for thirteen episodes) I will be enjoying even these few chapters on Blu-ray until this coming fall arrives. Highly recommended, even if you haven't seen the show during its run on AMC yet. One small detail: the Walking Dead comic book is published by Image, not Dark Horse.